One of the most important books about post 9/11 war and peace will likely be one of the least read books published in recent times. War sells; peace does not. War has its own Public Relations (PR) agencies, its own state-subsidized industry, and its own mythology. Peace does not. The cowboy stories of “good guys” versus “bad guys” have been promulgated and exploited by the West and its agencies (and blindly accepted by media “consumers”) to such a degree, that the truth has literally been inverted. White is Black, and Black is White. Not only is Canada at least partly responsible for mass murder, the total destruction of foreign countries , and waves of refugees, but we are paying a price at home in terms of lost freedoms, and increasing impoverishment. 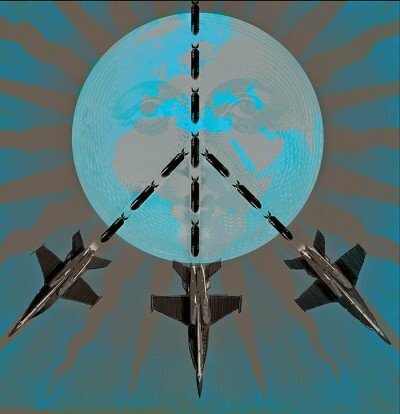 Today’s Illegal wars of aggression are a plague on humanity that, at best, enrich the transnational oligarch class, as they reduce target countries to ashes. But the lies are smothering the truth. For example, we live in a world where, on the one hand, we profess to be fighting ISIS, even as sustainable evidence has shouted for years that ISIS and all the terrorists invading Syria, including the “moderates”, are Western proxies. Our repeated failures to diagnose the root causes of our current dystopia is the basis of our degeneracy. And the root causes include psychological operations (psy ops). The age-old military strategy of false flag terrorism has triggered our expertly disguised degeneracy. False flag terrorism involves the false attribution of a crime to a designated enemy, and most, if not all wars, are triggered by false flag terrorism. Thus the book, Another French False Flag?|Bloody Tracks From Paris To San Bernardino, Edited and Introduced by Kevin Barrett should be a “must read” for anyone attempting to understand, and act on, the current state of permanent war afflicting humanity. Another French False Flag?|Bloody Tracks From Paris To San Bernardino analyzes the root causes of synthetic terror events (ie false flags) and puts the onus on state authorities to prove the theorists wrong – which they have yet to do – through judicial public inquiries. Straw man arguments and “conspiracy theory” smears are becoming increasingly stale. If the masses want peace and a “peace dividend”, where tax dollars are actually spent to improve their lives, local economies, anad a return to democracy, then Barrett’s book is a “must read”. If, on the other hand, we want the status quo of domestic police-state legislation, ruined economies, destroyed countries, and an overseas holocaust perpetrated by a globalized cabal of criminal warmongers, then the book would be best left unopened. Let’s hope that humanity’s better nature prevails. A first step is the truth.